Anita Georgeson unfurling the Shetland flag at top of Africa. 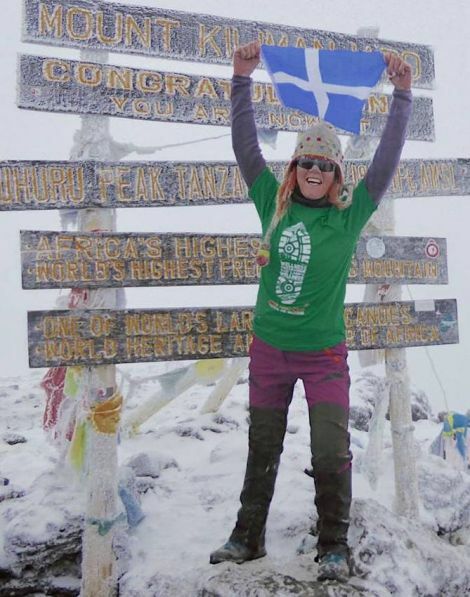 MIND Your Head fundraiser Anita Georgeson had well and truly smashed her £10,000 target by the time she returned from a charity trip to the summit of Kilimanjaro – the highest mountain in Africa. At the last checking, Anita’s efforts had made almost half as much again as the target and there are two more Lerwick Legion discos to come later this month, which should add even more to the coffers of the mental health charity. 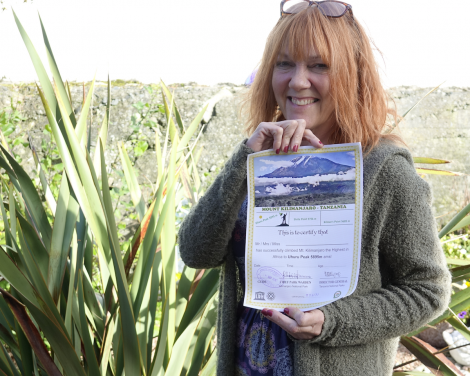 Returning to her Lerwick home on Monday, Anita said that seven-day Kilimanjaro hike, paid out of her own pocket, had been the “trip of a lifetime” but one that contained elements of genuine ordeal as well as extreme “highs”. 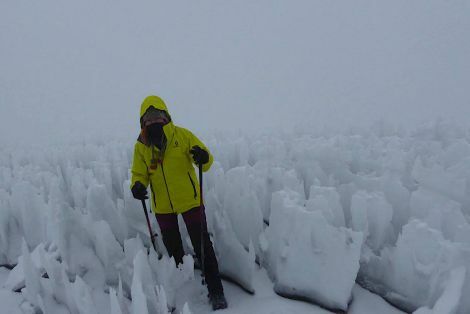 Before the start of her 11-day adventure there was little doubt that the fit 54-year-old would saunter through the walking aspect of tackling the 5,895m high icon – but altitude sickness is another matter entirely and not something everyone can avoid, regardless of fitness level. Anita met the rest of her 34-strong travelling party in London. After arriving in Tanzania following a 12-and-a-half hour flight via Doha in Qatar, the group embarked on a bus trip to their overnight lodge, which would be their last proper bed before the beginning of the climb the next day. The group had been greeted by “an amazing man”, Bryce, of Ashanti Tours, who looked after the porterage side of the excursion and had climbed Kilimanjaro “100 times”. Earlier they had been taken under the guidance of Stu, a no-nonsense Liverpudlian and professional mountaineer, who Anita said had given her the necessary focus with his “drill-sergeant” approach. Anita had “of course” packed too much, so had to leave most of her gear at the lodge. Climbers were limited to 15kg of possessions, which was as well for the porters, who carried the bulk of it, plus much more. The party also had to leave their phones and other devices before setting out – not to facilitate skullduggery, but simply because they would not work on the mountain. “To be honest I loved the fact of having no phone, no purse, no car keys to look for,” Anita said. Seven days had seemed a long time for the climb of the dormant volcano, but after setting out for the mountain the next morning, reveille was at 5.15am every subsequent day, with hiking lasting from 7.30am to 5pm. Anita said that she had been “larking about, trying to get on the back of a muckle elephant” at the lodge, when the clouds parted to reveal the enormity of the mountain. Climbers’ jaws literally dropped at the magnificent and daunting sight. “We really did just look like tiny ants in comparison to this massive rock that stood before wis – it was amazing,” she said. Thereafter followed a two-hour drive to the base of the mountain after getting checked into the national park. The drive was punctuated by the breakdown of the first bus, with everyone piling into the second vehicle when it chugged into sight. Kilimanjaro was a succession of climate zones with rainforest giving way to heath, boulder fields and high desert before the final pumice-covered stage of the climb. At first it was plain hiking at an “awkwardly” slow speed, but Anita was astonished when the cry of “porters coming, step to the left!” went up and a human centipede of men carrying baskets of chickens, bread, eggs, tents, tables, gas cylinders, bags and everything including toilets zipped past, possibly fuelled by some sort of stimulant, with the burdens on their backs or on their heads. The cheerful, singing group then vanished from sight for the next half-a-day until the hikers were greeted miles up the trail with welcoming bowls of soup and chicken served by cooks in immaculate kitchen whites. Walking through the Ratzel Glacier: ‘something out of a story book’. “These guys were amazing. By the time we got to our camp area, our tents were all set up already and there were three mess tents with the tables and chairs ready for our evening meal that night. The food was just amazing, what with the little facilities they had,” said Anita. It was on the trip back down that Anita realised the porters were wearing a motley assemblage of trainers or old shoes they had fallen heir to – either discarded or gifted by their wealthy western owners. Soles and uppers had frequently parted company in this display of footwear. Day three was the first day of altitude acclimatisation, and a taste of what was to come. Though the group only climbed a paltry 500 feet during the day to 13,000 feet, Anita vomited repeatedly and was so sick she could not eat. The water, which tasted foul after being treated with purification tablets, did not help. Anita was lucky enough to be one of only three of the party to have her own three-person tent, the others having to squeeze in three at a time. After a good rest, she was right as rain the next day and had the “most amazing” time climbing a lava wall that separates two of the ecosystem zones. The sky also cleared and offered a stunning upside down view of blazing blue atmosphere above and a seemingly solid carpet of clouds beneath the party. Day five saw the climbers in high altitude desert passing cactuses as tall as trees. They made camp early in preparation for the final assault on the peak, which would see the climbers leave at 10.30pm, hopefully in time to see the sun rise over Kilimanjaro the following morning. After a broken rest they set out, the path illuminated by head torches below a blanket of stars scattered across the pitch black sky. Under them were the lights of a nearby town, as tiny as looking from a plane. “It was phenomenal,” Anita recalled. Luckily, this time it was not severe nausea, but a “sleepy, drunky” feeling that Anita suffered. Stu told her any falling asleep would see her escorted off the mountain, and that gave her a necessary prod. After what seemed an eternity, where she had to call on every reserve of her will to keep going, she reached the lip of the crater. A kindly porter, Sheja, had taken pity on her and took her rucksack the rest of the way. “He was me best pal,” said Anita. Others were less fortunate. One couple decided not to undertake the last stage – while another quit shortly after starting what would have been their last shattering stage uphill. A fifth woman had to be taken down wearing an oxygen mask. Unfortunately, the hoped for sunrise never materialised and it was a “blind moorie” by the time the crater loomed. It never properly got daylight that morning, the sky was that full of snow. Stu gave Anita the dreadful news that it would be another 750 feet and an hour’s hike up to Uhuru Peak and the top of Africa. “But at the rate you’re going, it will be double that,” he had added. But Anita knew she had broken her wall and she got her second wind, which carried her through the surreal Ratzel Glacier, “like something out of a story book”, whose surface was covered in vertical sheets of ice, like frozen sharks’ fins. “It was just these arctic conditions in somewhere I never, ever thought I would be in my life,” she added. 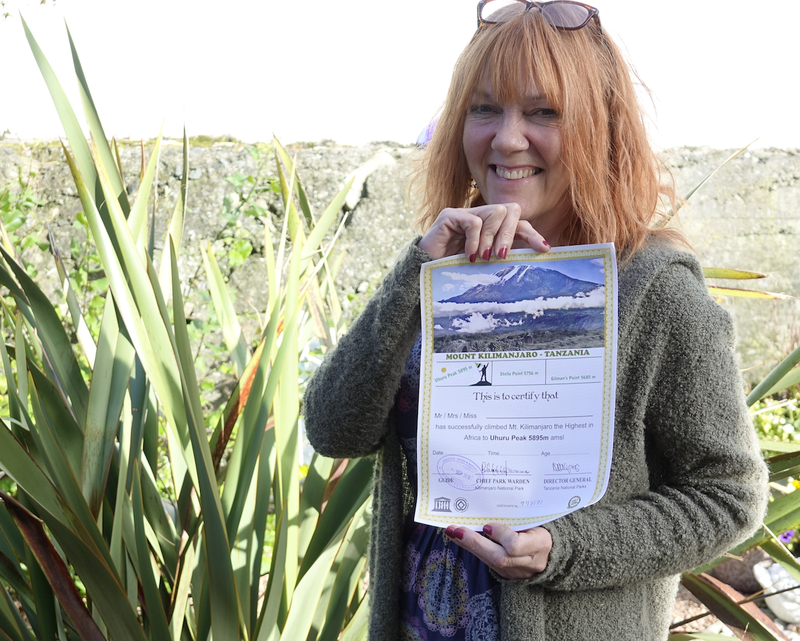 Anita could hardly believe her eyes when she saw the standing gate at the top of Kilimanjaro and Sheja was on the spot with her camera. Before photos, she had to stuff her Goretex jacket into the rucksack and don a Mind Your Head t-shirt and unfurl a Shetland flag. The amazing high of reaching the summit was short lived as altitude sickness took hold again on the way down and Anita had to be helped part of the way on the four-hour descent to camp, her legs having “turned to jelly”. After an all too brief slumber in her five-season sleeping bag, Anita and her party headed off again in sleety “Shetland” rain and on to their next camp. But this time she felt much better, with the whole party elated at having achieved what they had spent so much time and effort planning. A day later and back at base camp the entire group enjoyed what was the “best beer ever” – Kilimanjaro of course. The mountain is clearly a draw for charity fundraisers. Among the “big, happy family” of hikers was a large group from Leicestershire who were raising money for the LOROS Hospice. An “amazing” Welsh woman called Moira Jones, who Anita clicked with, was raising money for multiple sclerosis research. Moira is herself an MS sufferer of 15 years. Father and son John and Kieran Stanley were likewise raising money for cystic fibrosis. Kieran, 22, suffers from cystic fibrosis. Having raised nearly £15,000 has staggered and humbled Anita, who still has to appear on Radio Shetland’s Give Us A Tune with her brother and sister Ian and Lynn and host a GTL disco on 12 October and an “old school Halloween” DJ night organised by her daughter Hanna on 27 October. “If I got the offer of doing it again, I’d head of tomorrow,” said Anita, who added that she had thoroughly enjoyed the fundraising elements of the venture. These had given her the opportunity of bringing her many fun and like-minded friends together for some different activities. Mind Your Head service manager Anouska Civico said: “Mind Your Head can’t thank Anita enough. This amount of money is outstanding but it’s not all about the money.